Guide to Playa Flamenca, a popular coastal resort on the Costa Blanca. Playa Flamenca: One of the most desirable resorts along the Orihuela Costa section of the southern Costa Blanca, Playa Flamenca attracts thousands of holidaymakers each year, and has also attracted hundreds of Brits and North Europeans to purchase holiday homes, or even settle in this beautiful area of Spain. Only becoming built up since the early 1970’s, when some Flemish investors saw the potential of the area, Playa Flamenca, was little more than a patch of barren land, prior to 1972. Situated on both sides of the N-332 coast road, Playa Flamenca has a couple of nice sandy beaches, and has some good facilities down at the beach area. On the inland residential section, you will find more facilities and commercial centres (Via Park 1 and 2, Flamenca Beach etc) and also the market road, where the well known Saturday market is held, attracting even more people to the area. The local police station and the Town Hall (Ayumtamiento) for the Orihuela Costa is located close to the Mercadona supermarket, close to the N-332 in Playa Flamenca, and the Mercadona car park is the scene of a number of events throughout the year. 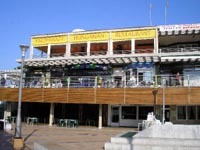 One of the main centres of activity in Playa Flamenca, is the Flamenca Beach commercial centre, which is just off the main road, and here you will find dozens of shops, cafes, bars and restaurants, with everything you could need to make your stay in Playa Flamenca a pleasant one. Golfers will be handily located for accessing the 3 courses of the Orihuela Costa, with Villamartin, Las Ramblas and Campoamor Golf, just a short drive from the resort. Other courses are also not too far away with Lo Romero (Campoverde) and La Finca (Algorfa) also worth considering. If you have tried out all the restaurants and entertainment in Flamenca Beach head along to Via Park (1 and 2), where you will find even more to try, or even pop along to La Zenia or Cabo Roig, where the famous strip has plenty to keep you amused. You will no doubt spend most of your time at the beach, and the fabulous Playa Flamenca weather, should enable you to make the most of your time here, with the best months, between May and October, though the weather here is pretty good all year round. There are no hotels in Playa Flamenca and most visitors take advantage of the huge supply of private rental accommodation for their stay in the resort. The ideal choice is to rent a villa with private pool in Playa Flamenca, and enjoy the flexibility that this offers. There are of course lots of apartments and houses which you can also rent. If you need a hotel you could try the La Zenia Hotel which is nearby or the Torrejoven Hotel in Punta Prima, you can book the excellent La Zenia Hotel by using the box on the right. Find a decent selection of Playa Flamenca self-catering villas and apartments, by looking lower down this page. There are also some properties for sale in Playa Flamenca, both by owner and by agent. Standing on both sides of the N332 between Torrevieja and Cabo Roig, Playa Flamenca is easy to access and is just 30 minutes from San Javier airport and 45 minutes from Alicante airport. It is also close to the AP-7, and to access the resort you are best advised to get off at the La Zenia exit.